Another of USA’s fine generation of cricket stalwarts in southern California is no more. Former USA captain and USACA president Jim Reid, who led USA to their first Auty Cup win in 54 years in 1966, died recently of complications from a stroke in southern California at the age of 91. One of the post-war era’s most noteworthy servants of the game in the USA, Reid was an active member of the cricket community in Los Angeles after migrating there from England in 1957. Aside from captaining USA to the Auty Cup in 1966, Reid was an instrumental figure as an administrator serving as USACA president from 1978 to 1980, helping usher USA into the era of one-day cricket with their maiden appearance at the ICC Trophy in 1979. “He had a job at a bank, but didn’t actually work at the bank. The manager was an East Lancashire cricket nut. He got a paycheck as an employee but he just played cricket,” said John Reid, Jim’s oldest son and a former USA batsman like his dad. “The game where he was supposed to play for Lancashire against Yorkshire in the first team, his boss put a bit of pressure on him to play for East Lancs. The backup plan had been to go to Australia instead, but the Reids stopped off in Los Angeles along the way to visit Doreen’s sister and her husband, a former American GI who got together during the war. Jim fell in love with the place almost from the start and they never made it to Australia. Doreen’s sister and husband sponsored Jim and Doreen to stay in California and the rest is history. After the first year with Britamer, Reid moved on to Pasadena CC where he spent 15 years and eventually became club captain. The Reid connection to the Brearleys was re-established along the way. According to author P David Sentence in his book Cricket in America: 1710-2000, future England captain Mike Brearley played for Pasadena CC under Reid’s captaincy during the 1966 season while Brearley was doing post-graduate research work at University of California-Irvine. John says his dad hosted Mike at the family house in Glendale on several occasions as a way to rekindle the wartime bond between Reid and Brearley’s dad Horace. 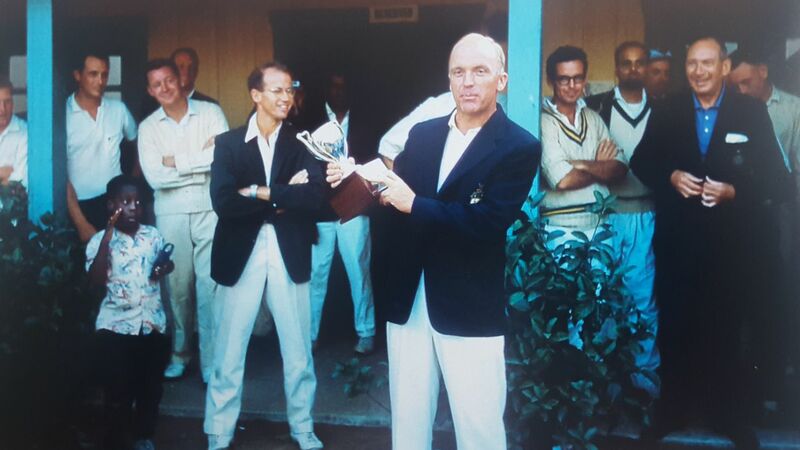 It was also around that time in September 1966 that Jim Reid captained USA to a 58-run triumph in Los Angeles in the annual two-day Auty Cup match against Canada, the first time the USA had held the trophy since 1912. It was one of five appearances Reid made for the USA men’s team starting in 1963 before his brief international career for his adopted country came to an end in 1967. “He would travel the country personally with his wife, my stepmom,” John said. “He would go to each of the four zones in the USA, the east zone, look at the games and the players to see if they were any good. No other president did that. He was never home. He was always flying around the country looking at different players. The inability to get past Sri Lanka left a sour taste in Reid’s mouth. By 1980, he left as president of USACA and disappeared from cricket almost altogether, aside from sporadic appearances at Woodley Park in Los Angeles. In later years he suffered from dementia as well as a series of strokes, the last of which finally took his life on September 27. But his cricketing legacy lives on in southern California through his son John and countless generations of players at Pasadena CC, University CC and the rest of the Southern California Cricket Association. “He loved playing for the US and leading the US,” John said.